Many Italians eat their main meal of the day at lunchtime so many pizza restaurants open only in the evening. Service is generally included in the bill in Italy so tipping is unnecessary. Restaurants close for one day per week. This is often Monday! Most first-time visitors to Bagni di Lucca find themselves eating in one or other of the two most obvious restaurants in La Villa. Either Antico Caffe del Sonno, identifiable by its huge "Restaurant" sign or in the Circolo dei Forestieri, immediately opposite. The first of these offers untroubled, if not necessarily inspired, dining to those unsure of their Italian language skills with its well-translated menus and Italian/English owners. The restaurant forms part of a small cluster of eateries that also includes a pizza takeaway, ice-cream parlour and upmarket teashop. The restaurant is generally tolerant of children and happy to produce a pizza at lunchtime. The Circolo dei Forestieri is a distinguished looking building in a small Piazza, now used as a car park, and roughly translates to "foreigner's club", its original purpose. The large and highly ornate restaurant, open to the public when not in use for wedding receptions, First Communion parties etc, in which it specialises, offers a good value tourist menu in stylish surroundings inside, and externally, under its front portico. Service is generally good but eating here can be a lonely experience due to its large size. 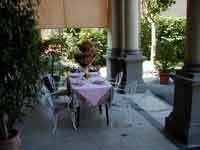 However Bagni Di Lucca can offer many other restaurants with many of these offering fixed-price lunch or dinner. For this the going rate is generally around €8 for two courses, which depending on the generosity of the establishment, may also include drinks. These might be considered more suitable for the more intrepid diner as in many cases they do not have a written menu but merely a selection of perhaps 3 to 5 first "Primi" courses and a similar number of "Secondi" which will be recited to you by the waiter or waitress. For those with a least a loose grip of restaurant Italian this should not cause too many problems. Our personal favourite amongst these is the restaurant attached to Bar Borghesi (closed Tuesday) at 85, Via Umberto I. This offers two courses, a vegetable side dish, water or wine and coffee for € 8 and shines by both having the daily selection written on a board and by offering a good range of choices for each course. A similar deal, also with menus, can be found, on weekdays, in Pizzeria Da Mamo almost directly across the street. For those looking merely for a pizza, although both of these also serve a small selection of other meals, we would suggest the Pizzeria Ponte D'Oro (closed Monday) on the Chifenti side of the footbridge that connects Chifenti with Fornoli or I Foletti (The Pixies!) on the SS12 at the eastern end of town. For those just looking for a snack all of the bars in Central Bagni provide a selection of fresh panini and pastries.